Schedule a private appointment at our design studio. 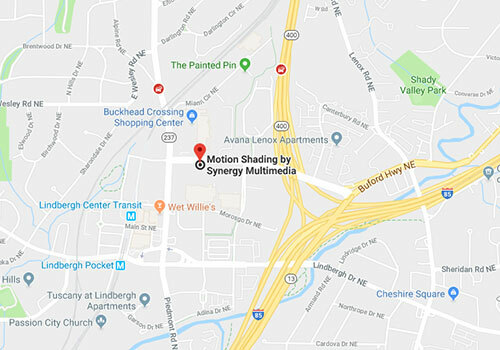 We welcome walk-ins at Motion Shading and are here to assist you in every way that we can to select the perfect automated window shading products for your home or business. Please feel free to contact us by filling out the form on this page, and we will return your inquiry in a timely manner. As the premier shading solutions provider in the Southeast, we look forward to serving you! For all service requests, please fill out the form on our service page. (404) 733 6060 Visit our state of the art showroom located at: 2571 Piedmont Rd NE Suite 110 Atlanta, GA 30324 Hours of Operation: Monday – Friday 10:00 AM to 5:00 PM Saturday 10:30 AM to 5:00 PM All other times by appointment.